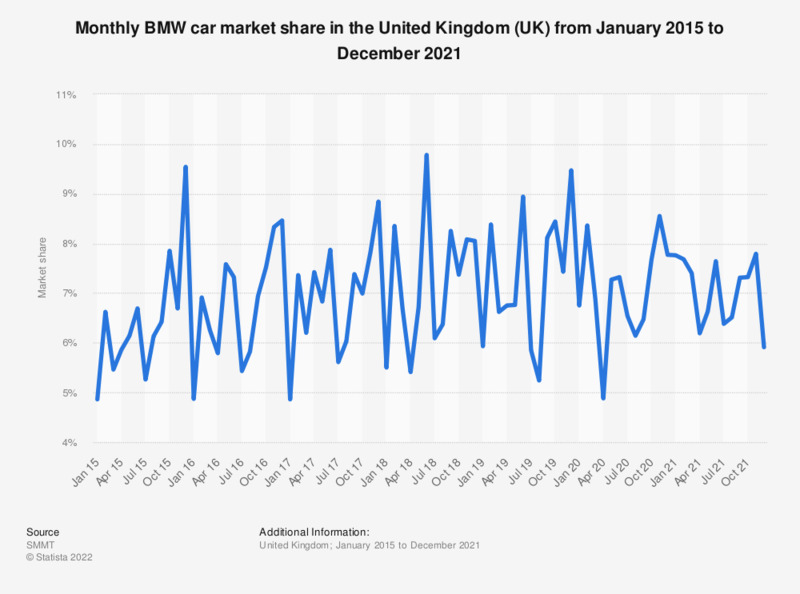 This graph shows the monthly United Kingdom (UK) market share values for BMW between January 2014 and September 2018. The company's market share had a range between 4.42 and 9.54 percent, meaning it consistently controlled a relatively high portion of the UK car market. BMW had the fourth highest car sales in the UK in 2015. In 2017 the monthly UK market share values for BMW ranged from 4.86 percent to 6.91 percent during January and February 2017, with a market share of 6.2 percent in March 2017. Compared to the previous years, this is almost the exact same market share for the months January to March, with only small differences. Regarding the previous years, the strongest months for BMW in the UK have been November and December. Only a few companies like Vauxhall, Ford and Volkswagen held a higher market share than BMW in the UK.